THANK YOU FOR ASKING !!! Thinking of you. Please take care. Thank goodness! So glad to hear. Stay safe. Thinking about you at this moment, such a dreadful terrible thing to happen. Please stay safe. Lovely to see a small piece of love and humour this morning. Glad that you are okay Carole. Relieved to hear that Bear's okay! And, obviously, that you are too! Take care! You are one who gives the world fun, adventure, beauty and connection. your comfort, peace and calm during this upsetting time in France. Our prayers to all the people of Paris. We can only counter these random acts of violence with random acts of love. Love will triumph. Carol, you have made us all feel like Parisians--taking us with you as you experience this wondrous city. We are thankful you are safe and stand with the people of Paris. Sending love and hugs to you and all your French friends. Crying as I write. So awful. So sad. Wishing love and healing to encircle you. Your picture of dear Bear brought tears to my eyes this morning....happy that you are okay and sad for everyone who was not. Stay safe! I've been thinking of you till I could get online and ask. Thanks for sharing this. I hope those you know and care for are all right. Heart is breaking. So glad to hear from you. We are all praying for you. I was hoping you would post and let us know you are ok and anyone you know personally; your friends and colleagues, the Parisian people you meet and interact with every day. I am so sorry for Paris, for France, for you and all of us living under this monstrous evil . Prayers for France and the French people. Me and my granddaughter spent a glorious week in the beautiful City of Lights this summer. Strength and love to all the people of France and especially Paris in light of the terrible atrocity. Glad that you and Bear are okay. Keep safe. We are thinking of you as we follow the tragic news of our favorite city. Warm thoughts from your friends in Oregon. Breathing a deep sigh of relief...wondering if you might have heard anything from Adrian Leeds? We feel so bad for all Parisians. This is very disturbing. Wishing you love, peace, and light from your PB friends in Seattle. Merci, Carol for letting us know you and Bear are safe. My arms stretch out to give you and Bear a big hug and many bisous. You have become a blog-friend that I enjoy so much. Carol, I'm relieved to know that you are safe. No words can express the horror. My heart aches for each of you during this horrendous experience. Sending hugs of comfort to you and Bear. Stay safe. Thank you for letting us know that you and Bear are safe! Our thoughts and prayers are with you and all of Paris. So relieved! Give Bear a hug from me (one for you too) and my prayers will continue for all of Paris, France and this world which seems go crazy ever now and then. I am so heartbroken over this & holding my breath that no more ugliness willbe seen. Thanks, Carol, for letting all of us know that you and Bear are safe. My heart wishes seem to be focused on all of Paris. We don't watch T.V. that much at our house, but the first thing we did today(after coffee!) was turn T.V. on. What has happened to Paris this weekend defies understanding, and so many of us here in America are horrified. Blessings to all in Paris. Good news in the midst of such terrible news! I was in Paris at this time in 2013. So heartbroken by the senseless violence. 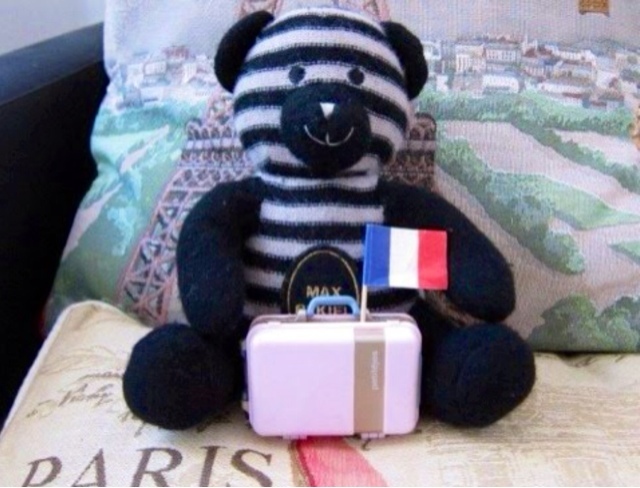 Sending wishes of hope to you, Carol, to Bear, to all of Paris and all of France. This time next year I will be in Paris, my favourite city in the world. And I will still come. It sickens me to hear about these terrible attacks and the heart break for all. My thoughts of strength and warmest wishes to heal and move on as best as can be done are sent to my City of Lights. Your many friends in Canada are behind you Paris! Good to know, Carol ....take good care of yourself and Bear. always good news to see you are both alright. Thinking of all the lovely people in Paris .We were there in May in the 3rd Arr. Thank goodness. U.S. is thinking of Paris. I have been thinking of Bear (and you!) and am relieved that you are both alright. My thoughts are with you and the people of Paris. Warmest wishes. Bear is good company especially during times of crisis. Glad to hear you are ok Carol. Hugs to you and bear. So happy you and Bear are safe, Carol. My prayers and tears for the victims of this horrific assault on innocents.